You know it’s been a cold couple of weeks when 40 degrees feels warm! 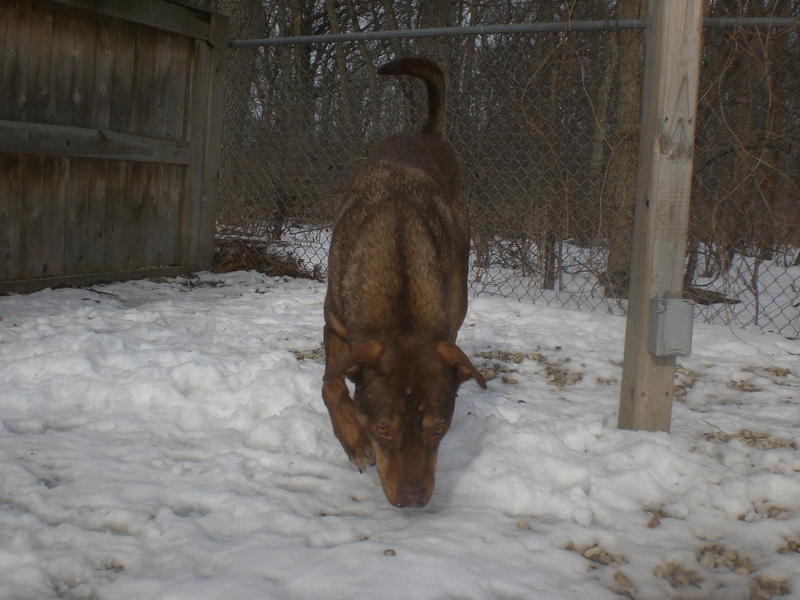 The dogs at Orphans of the Storm® were eager for a chance to romp in the winter sunshine this week. If you’re looking for a big dog who can keep up with your adventures, there are plenty of options right now! Charlie the three-year-old Shepherd mix came to the shelter with his brother, Bravos (see below), after their owner got too allergic to keep them. Charlie and Bravos would prefer to be adopted together, but if two big boys are too much for you right now, they can go to separate homes. Charlie is the smaller of the two, but definitely the more energetic one. He was running this way and that way and was thrilled to have the chance to race a dog on the other side of the fence when we were in the off-leash run. Charlie is an affectionate boy. Once he had burned off some of his energy, he came bounding over to me so I could pet him, and he thanked me by giving me a few doggy kisses. He was interested in tennis balls and liked chasing after them, but hasn’t quite mastered the second part of ‘fetch’ that involves bringing the ball back! He’s a smart boy, though, so with a little practice he’ll become an expert fetcher. Charlie has a lifetime of experience as a pet and is ready to join his new furever home. If you think that home might be yours, come in soon to say hello to Charlie! Bravos the three-year-old Shepherd mix is Charlie’s (see above) big brother, size-wise. Although he’s a little calmer than Charlie, he is extremely strong–I don’t think he even realizes his own strength. He seems to get along well with children, but the adults in his future home should be the ones responsible for holding onto the leash. 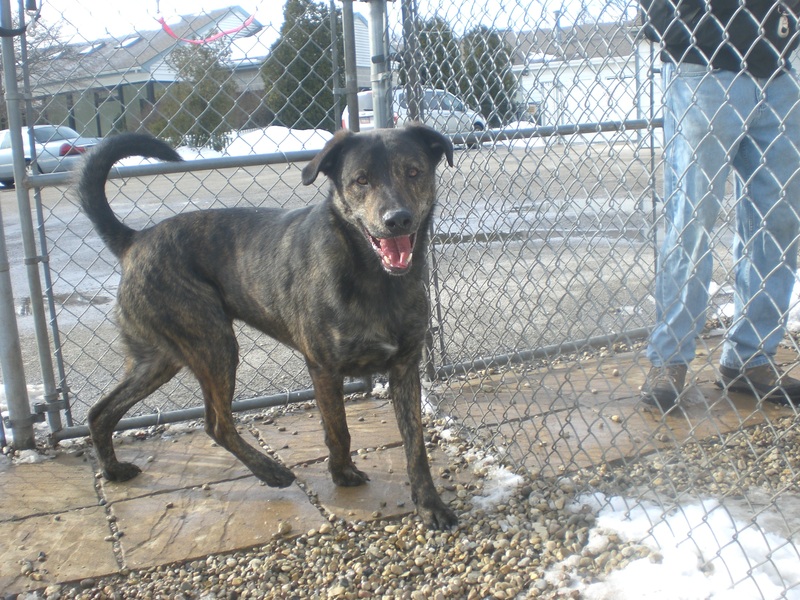 Bravos is a handsome boy who just loves getting attention. Bravos is already at the expert level when it comes to playing fetch. He had a fun time chasing after the tennis ball, batting it around in the snow with his front paws, and then dropping it near my feet so I could throw it again. Bravos also likes to give doggy hugs, but might accidentally knock you over with his exuberance if you aren’t paying attention. 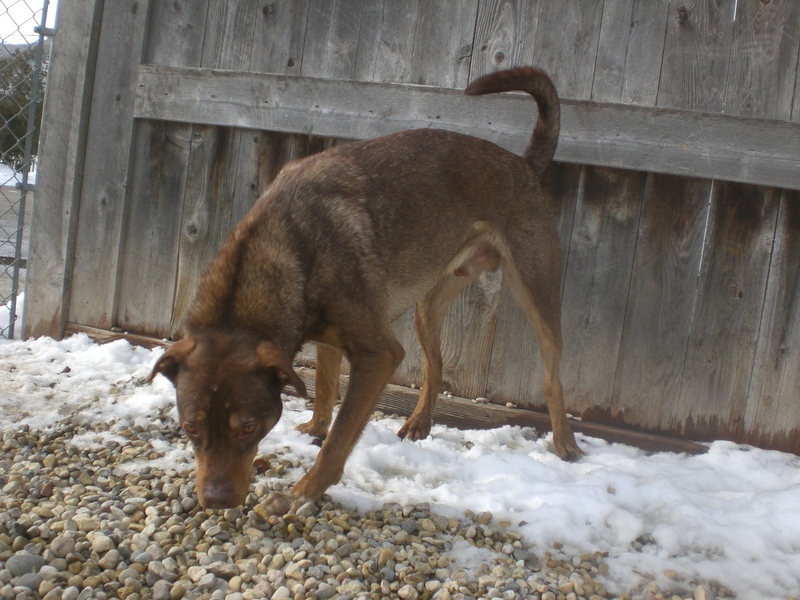 Bravos hopes he and his brother can find their new home(s) soon, so don’t make them wait too long! 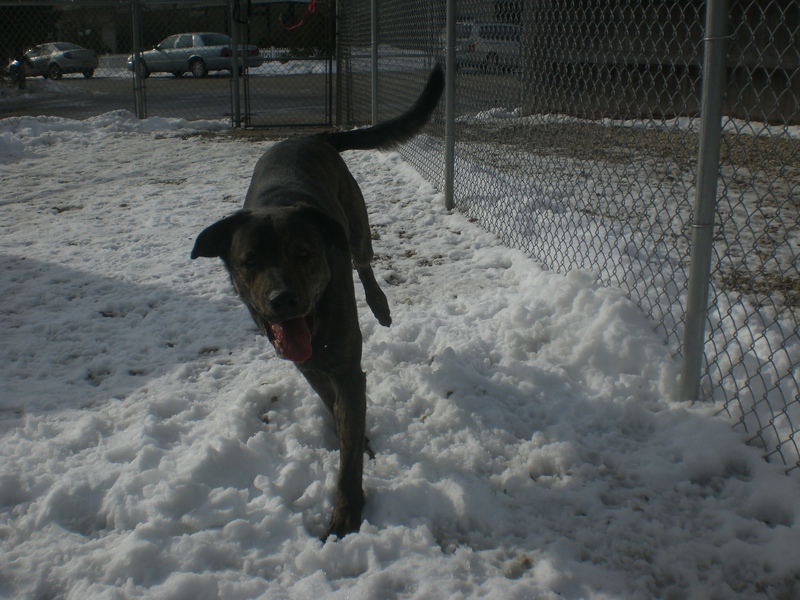 On your next visit to the shelter, be sure to say hi to Bravos. 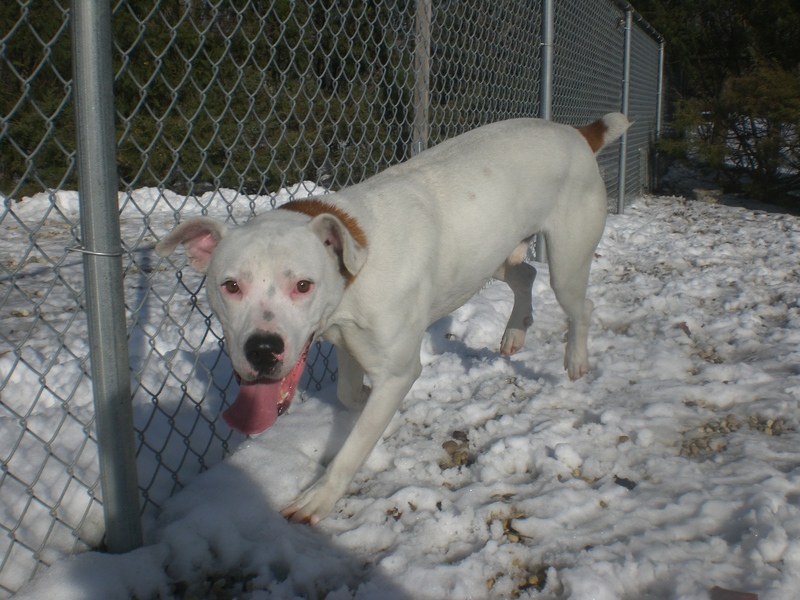 Boston the two-year-old American Bulldog mix is a happy dog who seems to want to be able to do everything all at once. He would jump up to give me a doggy hug, then hurry towards the off-leash run, then stop and sniff a pile of snow, and repeat. Boston seems like the type of dog who would absolutely love to have a yard to call his own. His face lit up once he was able to romp freely in the off-leash run. Boston is such a cutie. He’s one of those dogs who looks like he’s smiling all the time. Based on how much his short little tail wags (which is almost constantly), he probably is really smiling! He may bark a bit when he’s inside his kennel, but that’s because he’s saying, “Pick me! Pick me!” Once he was out and about, I didn’t hear a peep. 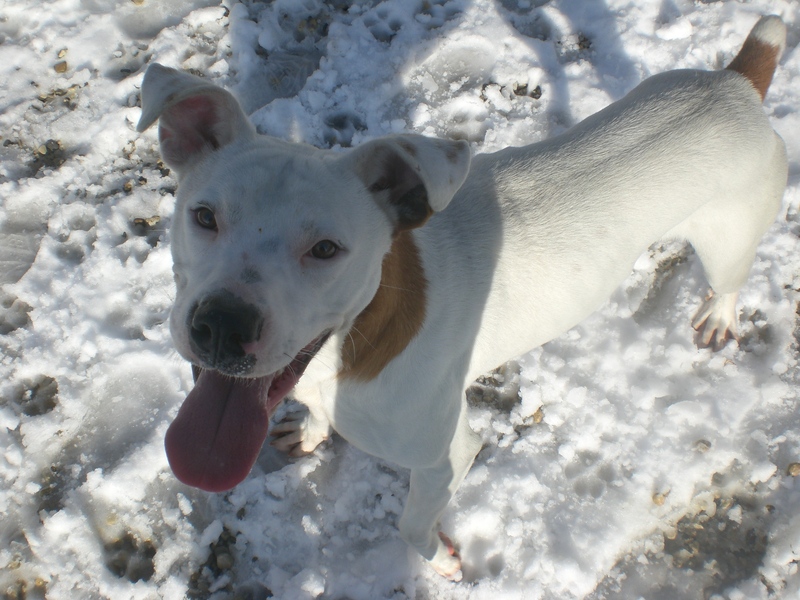 If you’re looking for a fun, playful pooch, come in soon to meet Boston! 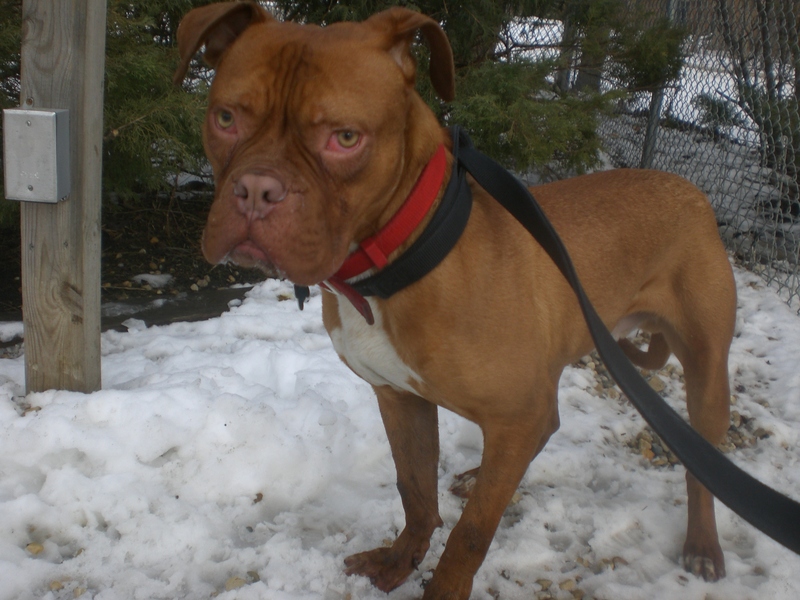 Hooch the two-year-old Dogue de Bordeaux mix is very shy and nervous at the shelter. He was a little resistant to walking on the leash at first and needed a bit of coaxing, but he soon realized that it’s not as scary as he thought and ended up being a pretty good leash-walking companion. Hooch always looks like he’s thinking deep, serious thoughts with that adorable face of his–but then he sticks his tongue out a little bit and you can’t help but laugh. 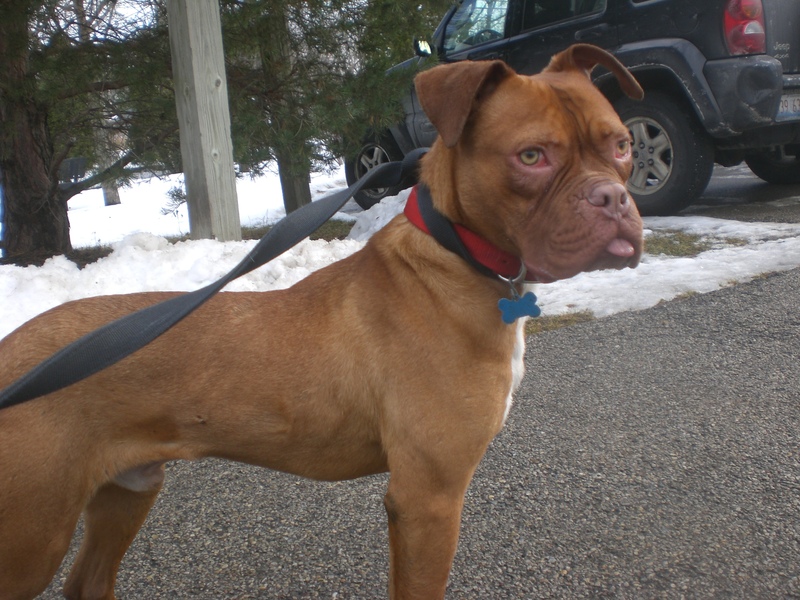 Hooch needs a patient, understanding owner who will help him come out of his shell. He was already making progress just during our short time together, and seemed to decide that getting love and attention from people is actually a good thing. He stood by my side while I scratched under his chin and pet his back. Everybody I saw walking past Hooch’s kennel mentioned how cute he is, so you better hurry in if you think Hooch might be the pooch for you! I also saw Bella (who is so sweet), Blush (who has been waiting at the shelter for far too long), Corky (who loves to play with doggy toys), Courage (who is absolutely convinced she is a lapdog, despite her large size), Ebbie (who wants nothing more than a warm bed in a loving home), Rock (who got fully trained when he went to boot camp last year), Scotty (who is ready to become part of a new family), Skipper (who will be the most loyal companion), Tom-Tom (whose resemblance to a hippo will make you smile every time), Topaz (who loves to give doggy hugs), Tucker (who quite possibly loves to give doggy hugs even more! ), and Zha Zha (who would make a good running buddy). Posted by Meet the Pooches on January 22, 2015 in Dog Profiles and tagged adopt, American Bulldog, animal shelter, animals, Chicago, dogs, Dogue de Bordeaux, Orphans of the Storm, pets, Shepherd.